Alto saxophonist/free jazz pioneer Ornette Coleman, in the recording studio for bassist Jamaaladeen Tacuma's For the Love of Ornette (Jazzwerkstatt, 2010), said to a band about to break into a tune: "Fellas. Fellas. Can you hear me? Forget the notes and get to the idea." New York-based, Australian-bred alto and baritone saxophonist Lisa Parrott seems to have taken at least half of that advice to heart. It's uncertain whether or not she has forgotten the notes, but she most definitely gets to the heart of the idea, and the feeling. 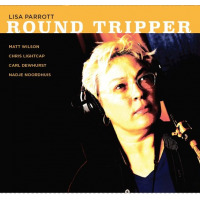 Round Tripper, Parrott's first recording as a stand alone leader (she's co-led a couple of dates), opens with "Rosa Takes a Stand," a prickly, angular melody that sounds like something Ornette C. might have written (he didn't; it was penned by Carlos Ward). Parrott is on alto here, and she brings as much feeling, as much human emotion to the mix as anyone out there. It's a sound with a backbone, with a soul, with verve and resilience: a quartet dynamic born of a perfect confluence of disparate personalities gelling toward a common goalgetting to the idea. Parrott on baritone, on "Do You Think That I Do Not Know," is a deep marination in melancholy. The quartet is bolstered here with Nadje Noorhuis' rich flugelhorn, with Carl Dewhurst's silvery guitar slicing into the mood in a spare fashion. It sounds as if Parrott is sitting with her horn in an after midnight bar, contemplating the end of a love affair. "Dancing Laughing," anchored adeptly by ubiquitous drummer Matt Wilson's pop and bassist Chris Lightcap's bounce, brims with a joyous mood, and "Um Zero" takes things up-tempo, samba style, with Parrott's alto snaking around Dewhurst's succinct single notes. Then there's "Round Trip," from Ornette Coleman's New York Is Now (Blue Note Records, 1968) set. Parrott leaves the guitar out of the mix here, to feature her robust baritone riding in high gear on the bass/drums drive train, followed up by a marvelous rendition, from Aussie-land, "Waltzing Matilda," the leader's alto sax and Noordhuis' trumpet sounding particularly impassioned, getting deep into the feeling. Sounds like New York is now for reed woman Lisa Parrott.